Kim and I have just returned from two weeks in Ecuador. For a second year, I participated as a presenter for one of Cheryl Reed’s “Above the Clouds” retreats. Once again, the experience was awesome. We spent the week of the retreat at the El Encanto Resort outside Los Bancos. (“Resort” is a strong word, in this case. The place was lovely, but it’s not a resort in the way I think of a resort. It was more like a standard American hotel.) El Encanto is located exactly on the equator, near (or in?) Ecuador’s cloud forest. When we woke each morning, we could watch clouds being “born”. Condensation from the river in the valley below would rise in slow, misty columns — not unlike smoke from a bonfire — to form clouds in the sky above. Once, on a bright and sunny day, a wall of fog surged in from the south until everything was dim and grey…and then the fog slipped away as quickly as it arrived. Last year, attendees knew me as J.D. from Get Rich Slowly, which is how I’m accustomed to being identified. But this year was different. This year’s attendees were largely unaware of Get Rich Slowly before the retreat. Instead, they knew me because of this blog. As a result, they went into the week with a different preconception of who I am and what I do. It was interesting. At Get Rich Slowly, I wrote about my struggle to overcome debt and develop smart financial skills. Over the course of several years, Readers got to see both what I did right and what I did wrong. I presented a real-time log of who I was and what I was becoming. But here at More Than Money, most of my writing has been centered on presenting a (relatively) polished philosophy that I’ve been developing for a decade. My articles have been all about the things that lead to a happier, more successful life. I haven’t dwelt on my past mistakes, and I haven’t spent much time chronicling my current ups and downs. The result? This blog hasn’t painted an accurate picture of who I am today. I had to laugh at that characterization. Long-time readers (and those who know me in Real Life) are well-aware that although I’m always trying to become a better person, I’m far from having everything figured out! But Jen’s comment made me realize that even while sharing a well-developed philosophy, I need to leave room to explain the process that led me to these ideas and beliefs. It hasn’t been easy or quick! And I’ve made plenty of wrong turns along the way. Plus, the philosophy continues to evolve as I gain more knowledge and experience. 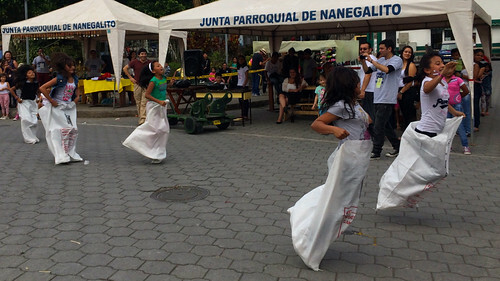 During a stop in the town of Nanegalito, we happened upon a town carnival. I liked this differentiation between happiness and well-being. Sure, you could split hairs over terminology, but it’s the concepts here that are important. With wisdom, we can overcome these outside forces to find a personal path to well-being. Learning to live in the present. “Suffering comes from resisting the present moment,” says Cain, “from longing for something other than what is.” Once the present is unfolding, it’s already happening and we no longer have a choice about what is occurring, so resisting it only brings unhappiness. Understanding our moods and emotions. There’s nothing wrong with becoming angry or tired or frustrated. But if these are a permanent state, they decrease your well-being. Instead of fighting bad moods or trying to figure them out, learn to “hang out with them”. Don’t make decisions while under the influence of strong emotions, but let them pass. Purposefully cultivating gratitude. Like many before him, Cain says that learning to be thankful for what you have is a key to long-term happiness. Waking in an uncomfortable hostel bed, for example, always makes him grateful for the comfortable bed he has at home. (Or that he even has a bed.) Driving through Ecuador made me thankful for the more calm and orderly roads at home. Learning about and training the mind. If you allow your “monkey mind” to control your actions and dictate your response to life, you’re abdicating responsibility for your well-being. Instead, learn how the mind works. Practice structured meditation and mindfulness in order to feel better and work better. “The more I meditate, the more beautiful I find ordinary moments and events,” Cain says. 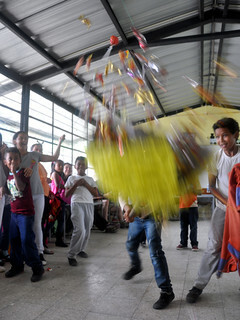 During our visit to the school, the kids played with a piñata. Sidebar: I had a rough stretch early in the trip. First, I dropped my digital SLR and shattered the viewscreen. (Fortunately, I’d brought my “cheap” DSLR on this trip.) It still takes photos, but I can’t preview them or make deep changes to the camera settings. Next, my MacBook Air gave up the ghost. While prepping for my talk, it shut itself off. It didn’t restart until after Kim and I had returned to Portland. (I suspect it didn’t like Ecuador’s humidity.) Then the navigation buttons on my Kindle stopped working. And lastly, my own body gave out on the day of my talk. After my presentation, I spent 24 feverish hours curled in bed. Following my own advice, I chose not to let these minor trials and tribulations get me down! 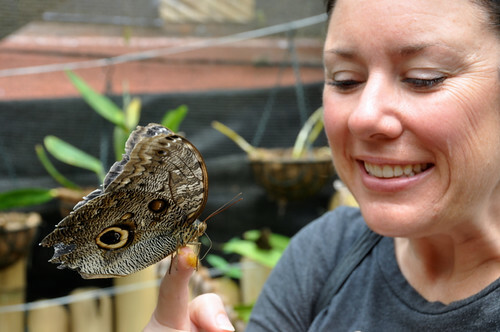 After our week in the cloud forest — which included hiking, a visit to a nearby elementary school, a tour of a chocolate factor, and more — Kim and I spent a couple of days exploring Quito. Then, last Monday, we hopped on a plane over the Andes to Coca. From there, we took a boat ride up the Napo River and into the Amazon basin. (Never heard of the Napo River? Neither had I, yet it discharges roughly the same amount of water as the Columbia River!) We spent several days exploring the jungle. We saw heaps of bugs and birds and frogs, but also caught glimpses of monkeys and more. 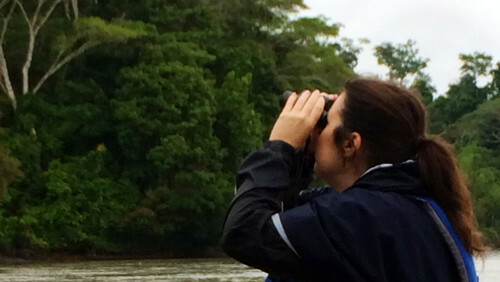 Kim keeps watch for monkeys and birds in the Amazon jungle. It was a good trip. We learned a lot and laughed a lot and explored parts of the world we hadn’t seen before. But it’s good to be home. I’m ready to resume writing in earnest — both here and for other outlets — and I’m eager to focus on physical fitness once more. Because, as Jen discovered when she met me, I don’t have it all figured out. I’m still learning and growing, just like everyone else. Well done, JD! And great write-up! Would love to join this someday. Hopefully after I’ve reached FI. Glad you try not to worry about stuff like the camera. I broke a brand new point-and-shoot’s viewscreen in Latvia this year. Felt terrible because it was a Christmas gift from my folks. I bought an exact replacement a few days later in Estonia (so my dad wouldn’t have to find out and be disappointed in the camera he chose). Thought I was being clever when I got home and ordered a $20 replacement screen from e-Bay to fix the previous one. Yeah, couldn’t install it. Way, way too tiny connectors. Oh, and dropped my mobile on the plane coming home as well. Bought a replacement phone for that and then dropped the new one *one week* later! Life and travel are messy businesses. But hell, world travel isn’t about photos, it’s about learning and enjoying the moment around you. I’m glad to hear that the second go-round was a success! I’m still putting into practice ideas I learned from last years event. Will Cheryl be doing this again last year? If so, it’s an event that I highly recommend. “But fear doesn’t give you direction and desire does.” Powerful! It sounds like David shared an amazing talk with you all. I appreciate the great recap. I would love to join you all in Ecuador at some point. I had to go with a different trip that was three years in the making (all this was happening at roughly the same time). If there’s a repeat, I might see you next year. I would love to attend this event one of these years. I personally like traveling to expand my mind and get out of my comfort zone and it sounds like this is a great opportunity! The concept of happiness being emotional weather is fantastic, and reminds me of my all-time favorite book, Awareness, by Anthony de Mello. It’s really a book that was written/transcribed from a seminar where he was speaking. And if anyone looks up the book, you may see that he has a religious background. Don’t be put off by that. I am an atheist, and it’s still the most important book I’ve ever read. His concepts are universal, and his language loving and all-inclusive. Looking forward to reading more articles soon. Hey J.D., do you ever consider your current position in life, philosophy, and advice you give others in light of survivorship bias? You owe a lot of your current position to the success of GRS, and while you put in a lot of time and effort to make that work, I’m not sure how repeatable that would be, especially without the knowledge you gained from doing it the first time. Would this advice apply as well to someone in a different position from yourself? What if they were not only in a different position from yourself, but didn’t have the required set of circumstances to succeed in the way you have? Driving through Ecuador may make you appreciate the orderly traffic of the more developed world, but there are a great many people who don’t have the opportunity to make such a comparison. I’m not criticizing, just curious what you think on the topic. Yes, I think about this all the time. I recognize (and appreciate) that I’ve been very fortunate, whether through chance or my own efforts (or, as is most likely, a combination of the two). I don’t think of it as “survivorship bias” per se, all though I think that’s an interesting way to frame it. So, as I’ve been developing my philosophy about meaning and happiness, I’ve tried to separate my own experience from the advice I offer. Does that make sense? I do use my experience to illustrate my points, but mostly I try to draw on the research of others and the shared experiences that others seem to have in common. Great question, Tyler. My wife and I have dreamed of traveling abroad but we get discouraged when we think about bringing our young children. Of course we love them to death but we feel that at this stage of our life and trip like this would be huge for us to tackle given the responsibility and stresses of young children. Right now we’re focusing on spending as much time with our family as possible and perhaps in a couple years we can start going on family trips.